My book shelves are already stuffed but who can resist some bargains? 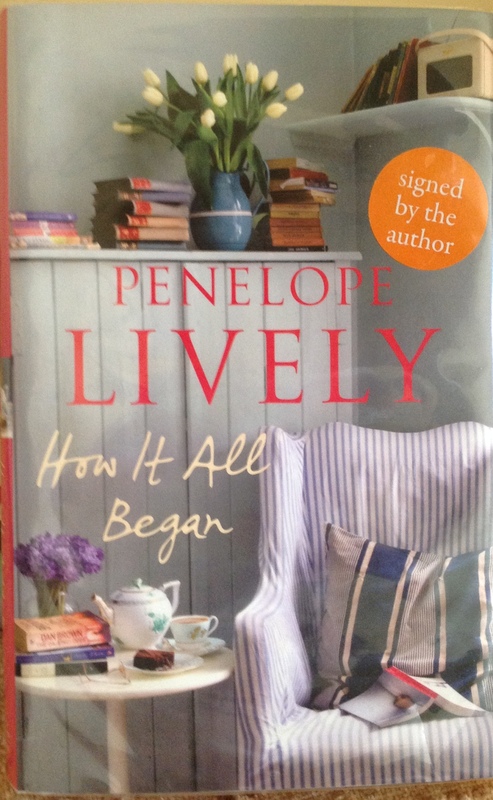 Especially one that I consider the bargain of a lifetime: a hardback edition of How it All Began by Penelope Lively signed by the author and on sale at the extraordinary price of 30 pence. Of course I had to buy it; who could possibly turn their nose at the opportunity? This purchase was from a library sale but I’ve also been picking up a few books from various second hand book shops in Tewkesbury and Cardiff. I’ve read only one work by Joseph Conrad (Heart of Darkness) and although I was often confused by the plot I loved his lyrical style of writing. I’m hoping Lord Jim is in a similar style. It is included in the Modern Library list of top 100 novels of the twentieth century as is The Secret Agent, both books are on my Classics Club list . Elizabeth Gaskell is another author on my Classics Club list though not the book shown in this picture. Ruth is one of her social novels, dealing with the theme of Victorian attitudes to ‘fallen women’ and illegitimacy. If its half as good as my favourite Gaskell North and South, I’m in for a treat. Andre Brink is a South African writer I’ve been intending to read for some years. An Instant in the Wind is his third novel and was shortlisted for the 1976 Booker Prize. Using the guise of an historical novel set in the eighteenth century, Brink shines a light on problems and contradictions of a South Africa based on apartheid. This is going to be a good companion read to Cry My Beloved Country by Alan Paton which I read earlier in the year and deals with similar issues. And then we come to the chunkiest of my finds; Dominion by C. J Sansom. This is a departure from his Shardlake historical mystery series since it’s a political thriller set in the early 1950s where Britain has become a satellite state of Nazi Germany. 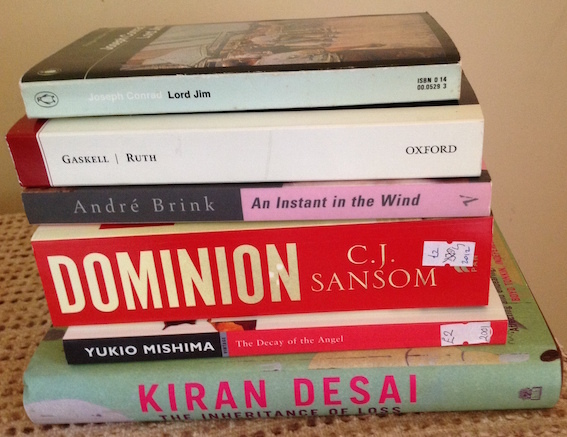 Wrapping up my little haul is The Inheritance of Loss by Kiran Desai which won the Booker Prize in 2006. Her victory was greeted with raised eyebrows because Desai had been considered an outsider among the shortlisted authors that year. In India there was an even stronger reaction with protests in Kalimpong, a town in the Himalayas whose residents were annoyed at the way their ancestors were depicted in the novel. The Kalimpong residents thought Desai’s who’s narrative dealt with a 1980s rebellion of the town’s ethnic Nepalese, presented them as little better than thieves and menial fools. Balancing that view however I’ve also seen several reviewers comment that Desai is also mocking Indians who assume English mannerisms and American capitalists. Should be an interesting novel. Any of you similarly found some bargains this week? Posted on August 9, 2015, in Sunday Salon and tagged Andre Brink, C J Sansom, Elisabeth Gaskell, Joseph Conrad, Kiran Desai, Man Booker Prize. Bookmark the permalink. 11 Comments. No bargains here either, so it’s doubly nice to peek at yours. The Lively would have been a pure pleasure for me to find as well. (But less likely on this side of the pond.) I remember enjoying Desai’s novel quite a bit; in particular the first few sentences were simply beautiful, IIRC. Enjoy your finds! No book bargains (yet) since I just got out of the hospital. It has taken me a long time to build up the concentration to read but I have almost finished a police procedural of sorts. I told the kids I wanted books in the hospital when they knew I was in no shape to read, but it feels good to be back in the pages, so to speak. I really enjoyed Inheritance of Loss. I also have Lord Jim in my collection, something I hope to read before I attempt to read Under the Volcano again because apparently there are many allusions to it in that book. I’ve read Brink too but not that title. It is interesting to keep in mind the time in which he wrote so many of his key works and why they were so subversive. good to know you’re on the road to recovery even if its felt a bit slow. I heard an interview on radio this morning on my way to work where Clive James said he wanted to buy every version of Lucky Jim available because he loves it so much. One of the local coffee shops my bookgroup frequents is moving location at the end of the month. It’s a place we usually leave loads of books, so last week I was in there and took a bagful away (we’ve had trouble retrieving books from another location when it closed). Great finds. I did find a couple of old viragos in a seaside second hand bookshop this week. The Magic Toyshop and The King of a Rainy Country. I remember loving The Inheritance of Loss but came across several who didn’t hope you enjoy it too. You have the magic touch with those Virago titles Ali….